Both dry and oily skin have different needs. Accordingly, there are different products that need to be used for dry and oily skin. One size fits all does not work here. Therefore, rather than reaching out for the store bought toner that is supposedly “good for all skin types”, why not make one at home, to suit your skin type and your requirements? It is not a difficult thing to formulate your own custom made toner. All you need to have is a little bit of knowledge about how each toning ingredient works. We tell you here how to make homemade toners for dry skin and oily skin – nothing fancy – simple recipes that will give you a well toned skin. After you are done cleansing your face, using a toner will help you remove any deposits of the cleanser and extra oil and grime from the pores and tighten the pores. A toner will also control the amount of oil that is secreted by the sebaceous glands on your skin, thereby helping you remain fresh through the day. Many store bought toners come with alcohol which helps kill the bacteria residing on the surface of the skin to prevent infection. How to use a toner? After you are done cleansing your face with a cleansing milk or face wash, tap dry it. Take a small amount of toner on a cotton ball and dab it all over the face. Avoid the eye area and the lips. Let it dry and follow it up with a moisturizer. Mix together the rose water with glycerin and transfer it to a spray bottle. Keep it under refrigeration. Use it everyday before you slather on your moisturizer by either spraying it on the face or dabbing it with a cotton ball. Grate one cucumber into a bowl. Now squeeze out the juice from the grated cucumber and strain it into a bottle. Refrigerate and use it everyday after cleansing your skin. 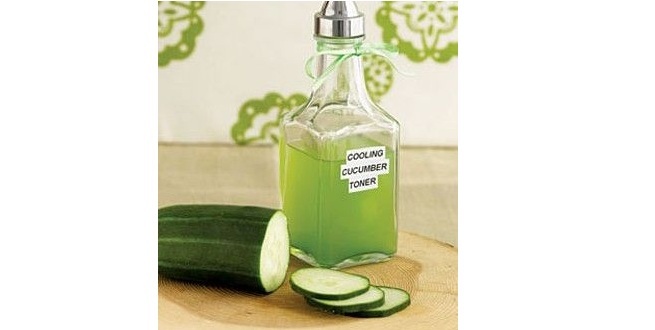 The chilled cucumber juice will gently shrink pores and make your skin supple. Toners are meant more for oily skin than dry skin. To tackle the sebum production, we prepare strong toners using some effective ingredients. Witch Hazel controls oil production and also targets skin infections. Apple Cider Vinegar restores the pH of the skin. Add into this mix a few drops of tea tree oil for relief from acne causing bacteria or lavender oil that will control oil production and you have a winner! Mix them together in a bottle. Shake it well before every use. Use daily to control oiliness of the skin. It is a well known fact that citrus fruits contain enzymes that prevent oiliness. Take the peel of a lemon and orange in a vessel and pour hot water over it. Steep it overnight. Strain it the next day and add a couple of drops of lemon or orange essential oil. Transfer to a spray bottle. There you go! You have your own refreshing citrus toner for daily use.